Abstract: Social development in China today is in a period for “unit society” characterized by plan management and identity management to transit into a socialist well-off society, a contractual society. The systematic construc-tion of a “contractual” teaching mode for some physical education teaching contents is in conformity with social development and education theories, and will be implemented in the practice of physical education teaching. 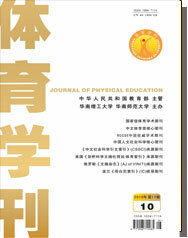 The research results indicate that based on its advanced teaching manner, harmonious teaching process and scientific examination method, contractual physical education teaching mode fully embodies the “people oriented” education conception as well as scientific development view that bases its fundamental priority on development. In today’s world where education is required to keep pace with the times, contractual physical education teaching mode will show its content contemporaneousness, paradigm scientificness and education comprehensiveness more fully.